Whether you’re a business person or an ordinary citizen concerned about what’s going on in the world, the yield curve is something you should care about. The yield curve is probably the single best indicator of where markets are headed, and perhaps the best indicator of an upcoming recession. Many decisions, from how to invest your portfolio to what kind of job you might take would be impacted if you knew a recession was approaching. Business owners, armed with this kind of knowledge, would be able to make more informed decisions about whether to expand capacity, invest or raise capital, borrow, change floating rate debt to fixed-term debt, or possibly even sell their business. 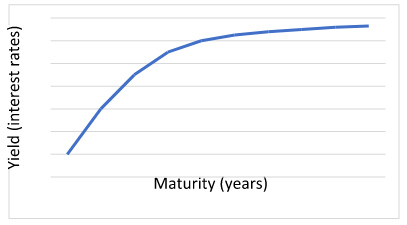 Built from all the interest rates paid by a particular government or corporation, after issuing multiple bonds with different duration, the bond yield curve in Figure 1 is a typical shape. The longer the term of the bond, the higher the yield, because, under normal circumstances, money is worth more today than tomorrow, as bond holders will typically look for a premium to postpone spending that dollar today. When investors perceive that a recession is approaching, there’s a flight to quality: They typically flock to government bonds, particularly US government bonds (the reserve currency of the world monetary system). In such times, investors are concerned about preserving the value of their holdings in the medium to long term. Hence there’s a so-called compression of the yield curve: The premium of long-term yields or interest rates over short-term interest rates diminishes (as is illustrated and discussed in more detail in Figure 5). In extreme cases, the yield curve may even become inverted (e.g. investors are prepared to accept a lower yield on longer-term than on shorter-term bonds). In such a risk-averse environment, investors are prepared to accept a discount in order to preserve capital. (b) How good a predictor of recession have yield curves been in the past? 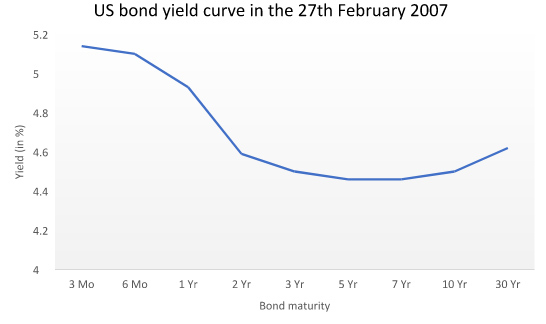 Historically, the inverted bond yield curve has been a signal of an impending recession as it has accurately predicted every recession since the mid-1960s, with only one false positive, in 1966.1 The 2007 inversion (Figure 2), followed by the 2008 crisis, is a perfect example of the strength of the yield curve as a predictor. While this yield curve was a harbinger of the 2008 crisis, it’s interesting to note that in subsequent months the extent of the inversion diminished and even stopped being inverted (Figure 3). 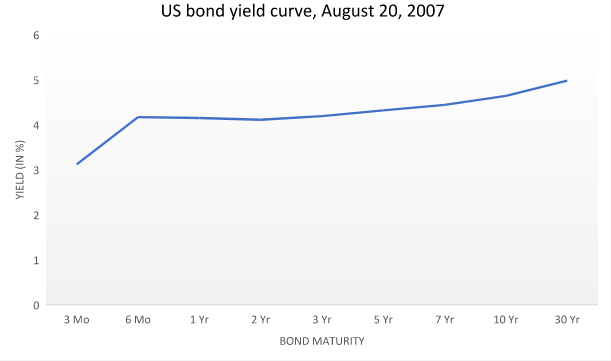 By the time Lehman Brothers filed for bankruptcy on September 15, 2008, the US bond yield curve was even less inverted (Figure 4). In the same way that an electrocardiogram doesn’t reveal continuous problems leading up to a heart attack, but may very well reveal some temporary negative patterns in the preceding weeks or months, so too with the yield curve. (c) What are yield curves saying today? In a nutshell, over the past two years, there has been a so-called flattening of the yield curve. 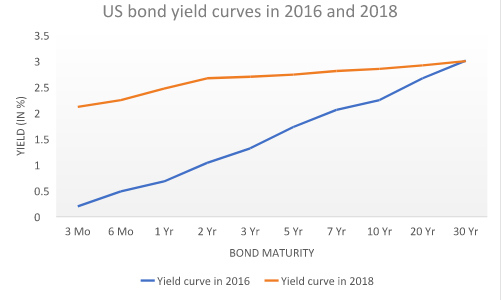 Figure 5 compares the yield curves as of January 1, 2016 to the curve as of August 27, 2018. On December 7, 2018, the five-year yield temporarily dipped below the three-year yield. This created some market panic, with the DJIA tumbling 799 points that day.4 Some investors feared that this was also a harbinger of a future recession. This was just a very brief inversion of the yield curve over a very short period; the curve has since normalized. Nevertheless, the flattening of the curve and this skittish inversion serves as a signal for caution. The bull market will not last forever. (d) What are the implications for business owners? Selling the business, or being prepared to ride the down cycle, until equity markets pick up again. These cycles typically tend to be of 5−8-year duration. Raising equity capital. This not only provides businesses with some “dry powder” to ride the recession; for those business owners who might consider acquisitions, it makes sense to raise or sell fresh equity in boom markets (when maximum equity may be raised with minimum dilution), and buy equity (e.g. acquisitions) during a recession, when equity is cheap. Switching from variable rate financing to fixed rate financing. During economic booms, interest rates are typically lower than during recessions. Hence, such an action could help a business ride the recession and not be choked by the high costs of servicing interest payments. Of course, we can never know with certainty when the next recession will hit. But the yield curve can provide some extremely valuable insights. Consult with one of our senior staff. © 2019 Copyright Euro-Phoenix Financial Advisors Ltd.